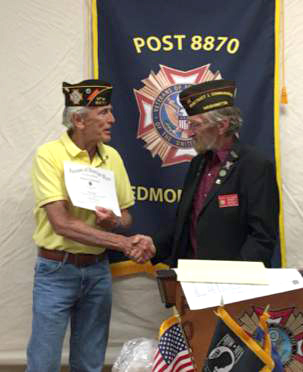 District 1 Commander Don Wischman was in attendance at the July Post meeting to present Post 8870 with a number of awards recognizing our accomplishments during the 2015-16 VFW year. 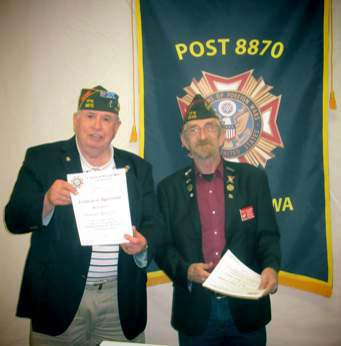 In these photos, Immediate Past Commander Jim Blossey is shown at top left, accepting awards from Wischman for, among other things, meeting membership goals. Also shown is (right bottom) is Chaplain and Past Commander Fred Apgar, accepting certificates of recognition of his tireless efforts in coordinating so many of our Post projects, including our Relief Fund, Teacher of the Year, Freedom Scholarship and Youth Essay. In addition to his leadership of our Post, Fred performs many of those same functions at the district level.